The Harvard Business School Association of Northern California, the Harvard Club of San Francisco, and Kellogg Alumni Club are pleased to offer kids of all ages (0-100) the opportunity to cheer on their local Ice Hockey team - the San Jose Sharks. John Tortora, COO of the Sharks, will join us as well and talk about the franchise and will host a vibrant Q&A session with our group. S.J. Sharkie will stop by to brighten everyone's day and deliver a few "Sharkie" goodies and have his picture taken. All attendees will enjoy a VIP pre-game meal prior to the Sharks vs. Anaheim Ducks game at 7:30 pm. In order to guarantee a ticket to this unique outing, order tickets soon! We know you will be happy to have planned this special day in advance. 6:15 pm: Reception with John Tortora in the FJ room. 7:00 pm: Buffet-style dinner will be provided in the Penthouse Plaza and served until the end of the 1st intermission. Two drink tickets will be provided to each guest to redeem at the Plaza Bar. 7:30 pm: Sharks vs. Anaheim Ducks in the Penthouse Plaza. Tickets will be held at "Will Call" under your last name. $130 for HBSA/NC, Harvard Club, and Kellogg Alumni Club members. Members may bring one additional adult guest ($130 each); $155 for non-members, $110 children (2 children tickets per member). John Tortora enters his fourth season as chief operating officer for Sharks Sports & Entertainment (SSE). Tortora oversees all aspects of SSE's business operations and serves as the organization's point person to SSE's ownership on all non-hockey matters. 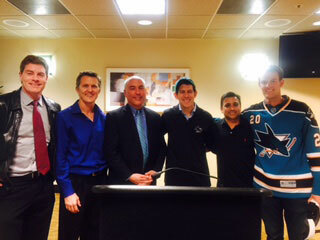 Tortora serves as an alternate governor for the San Jose Sharks to the NHL's Board of Governors and serves as the governor for the San Jose Barracuda, the Sharks Minor League Affiliate, to the American Hockey League's Board of Governors. In addition, Tortora works closely with General Manager Doug Wilson to establish and maintain a centralized and collaborative vision for the entire organization, encapsulating both hockey and business operations. For the past several years we have hosted exclusive events with the Kings, Warriors, Giants, Earthquakes, A's, Sharks, and Raiders. I am a venture capitalist at Norwest Venture Partners focusing on business software, but started my career in the sports industry. While at HBS, I worked for the NFL and Major League Baseball and then also began organizing events for both sports beginners and old sports fans. It was during this time that I realized the power of the sports industry from a business standpoint, but from a social perspective as well. My events have included dyed-in-the wool sports fans, but also those who are interested in visionary leadership, crowd-watching or simply spending time with a dynamic group of people and making lasting friendships here in the Bay Area. Today, we host about six events each year. Our group of HBS alumni and their friends and family from across the world, have made a positive impression on the teams. Each season, we are welcomed back and get to enjoy a collegial friendship that would not be available to us otherwise. 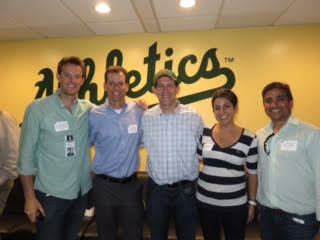 Many consider our group a highlight of the being an HBS alumnus here in the Bay Area. If you haven't attended our events in the past, we hope you do this sometime soon. Feel free to email me at sjacobsohn@gmail.com and I'll add you to our email list to give you early access to sign-up for upcoming sports events prior to promotion. Sean Jacobsohn HBS 1998, John Tortora (COO of San Jose Sharks and Harvard Law graduate), Kristen Badgley HBS 1998 and HBSA/NC Chair. At the Sharks game on January 23, 2016. Sean Jacobsohn HBS 1998, AJ Gandhi HBS 1998, Dave Dykeman, Izabella Zhu Harvard MPA. At the Kings game against the Warriors on January 9, 2016. Jeff David (Chief Revenue Officer of Sacramento Kings), Chris Granger (President and COO of Sacramento Kings), Sean Jacobsohn HBS 1998, Larry Kelley (owner of Sacramento Kings and HBS 1971). At the Kings game against the Warriors on January 9, 2016.